Most of these cacti were gifted to me. There is also a climbing cactus that has been growing like a weed. Bush league egg carton for now. 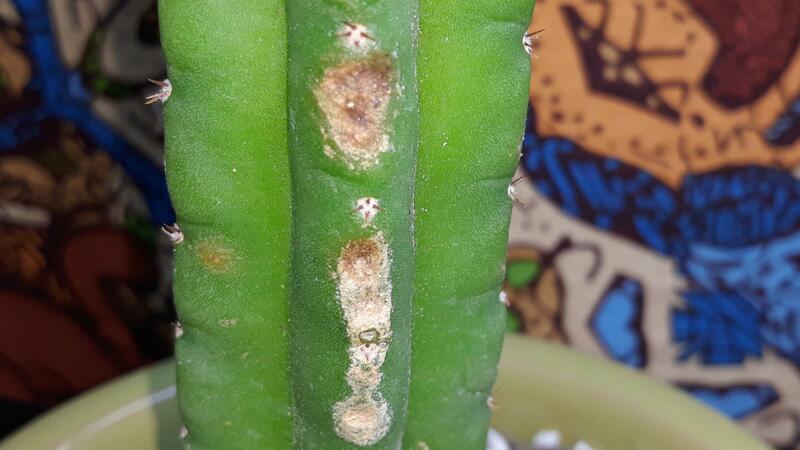 San Pedro: mold spots started growing soon after I got this one. I decided to sterilize a razor and I was able to remove the spots. Cinnamon was added and soon after the started with the narrow point. Lack of sunlight. Bear in mind I can only keep them inside facing East on my windowsill. Ended up getting more mold so I sliced the tip off 4 weeks ago. The same thing is happening to the SS02 torch on the right side of picture # 2. Only had these torches for about 4 months now. I'm using a succulent & cactus soil mix from Amazon. 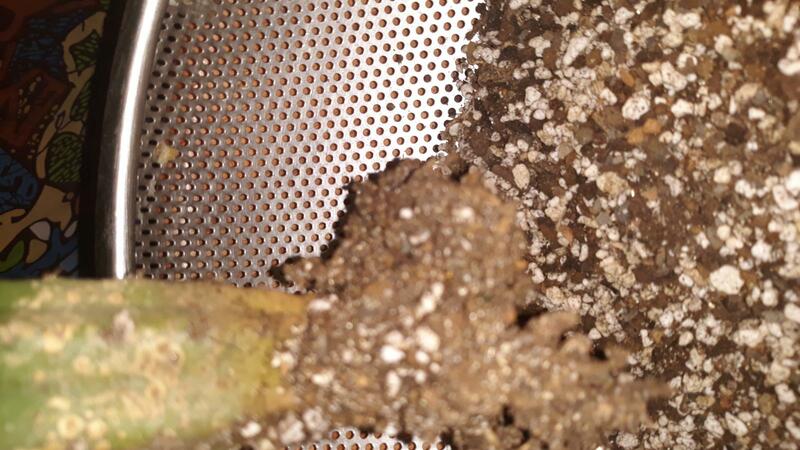 I did add some perlite, sifted peat moss and some vermiculite and some powdered oyster shell. 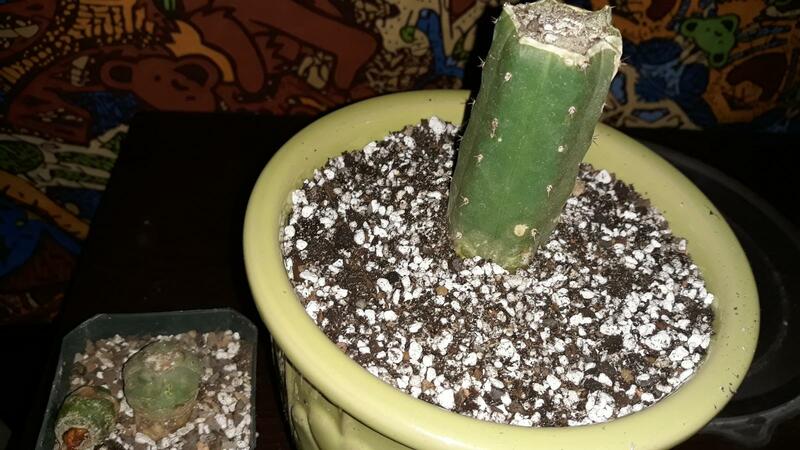 Still clueless when it comes to the correct cactus mixture. The 2 little guys were looking good for the first 3 weeks. All it took was one curious cat to push my bedroom door open while I took a shower and chewed away on the 2 seedlings. Alberto I think it's safe to say goodbye. The root has fallen off and has an orange hue inside. 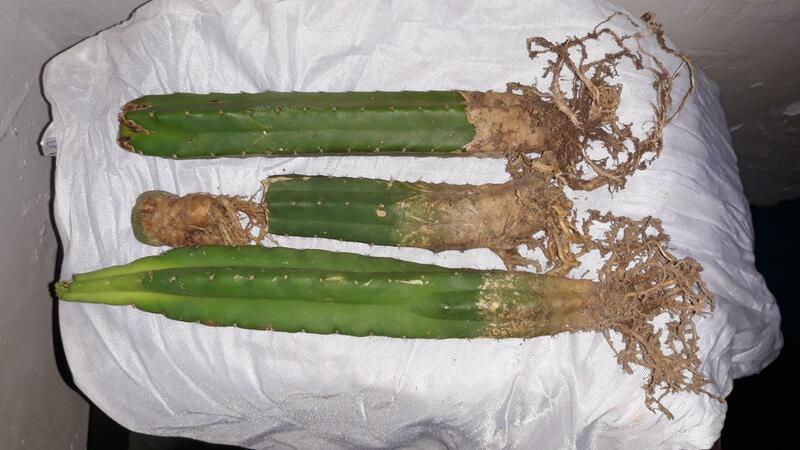 The Aricarparus sp williamsii is damaged but it's root looks and feels like new. Does this one have a chance to recover? I put some cinnamon powder on both seedlings thinking it would save them. On a good note I was able to get 5 seeds from it before the cat attack. The last one I needed some advice about as well is the Brigesii. The one that snapped in half accidentally. Top heavy and I was careless when moving it. It's been almost 4 weeks since it snapped off. I have it next to a fan with high hopes I would see some roots sprouting from the base by now. 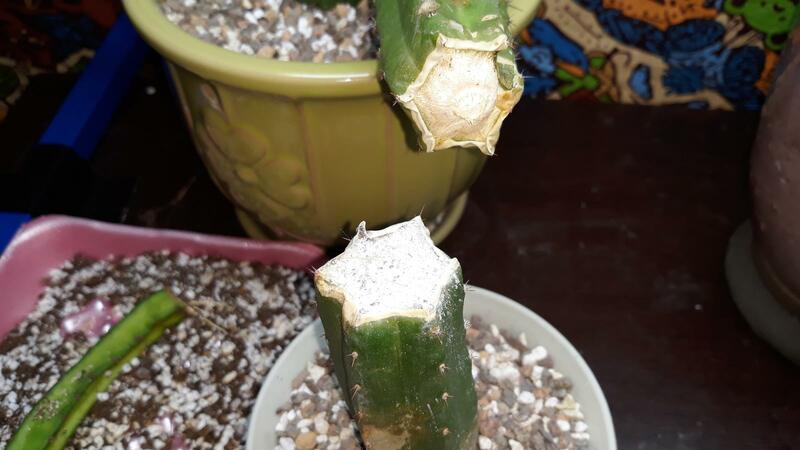 Is it okay to leave like it is inside the pot or does it need to be cut a certain way. It's still warm and sunny where I am and will remain this way throughout the winter. Should I wait till spring to replant this one? Any advice positive or negative will help me out with my cactus decor. Edited by Cigarsam, 06 October 2018 - 11:50 AM. You are going to need to add a good amount of light, and toss the soil and start over. Vermiculite is an absolute death trap. Peat moss is another. Both of these retain water, creating the perfect storm for rot. The orange flesh is rot. Not as quickly deadly for the trichs, but really bad for the Lophs. I am sure the cactus mix was good to start with. Additives that would be good would be coarse sand , pearlite, oyster shell for the Lophs, and maybe some fine gravel. 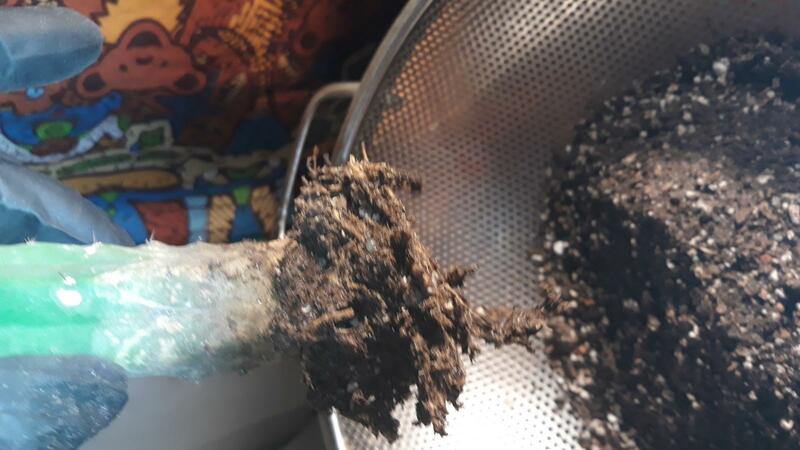 You want the soil to drain out when you water in about a minute. At this point I would pull everything and dry out the base. Check a few days later for any soft mushy material. and remove it. Then let that scar to a hard seal before replanting. 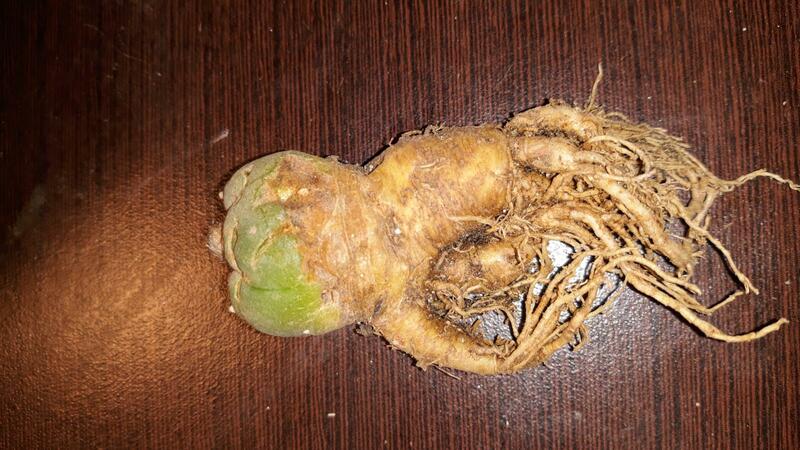 I would pick up some "Root tone", the powder rooting hormone, and dust all the scar areas with it before planting. I think the One Loph is savable, if the soft rot does not extend inward too far. When you cut, sterilize the blade frequently, and go no farther than needed to get to solid flesh. Dry the cuts as quickly as you can. The fan is good. Once you get these in a better soil, don't water until you have at least one root to drink. You will need to verify that by gently lifting, but if you keep the soil warm, it roots faster. Expect about a month for any that have no roots at all. If you get some lighting to add, do it in stages so you don't burn them by increasing too fast. I just finished getting the majority of the soil stuck on the roots. I'm going to place them by a fan and check on them in a few days and hope they are healthy. Still hoping for the best with the little one. It's roots didn't feel mushy though. Those roots all look pretty good. If they feel solid, that's extra good. Use your nose as well. Any sour or sulphur smell can lead you to a soft decaying area. When you repot, use a dusting of the root tone first. The rooting hormone stimulates new root, and also retards any rot from taking hold and spreading. 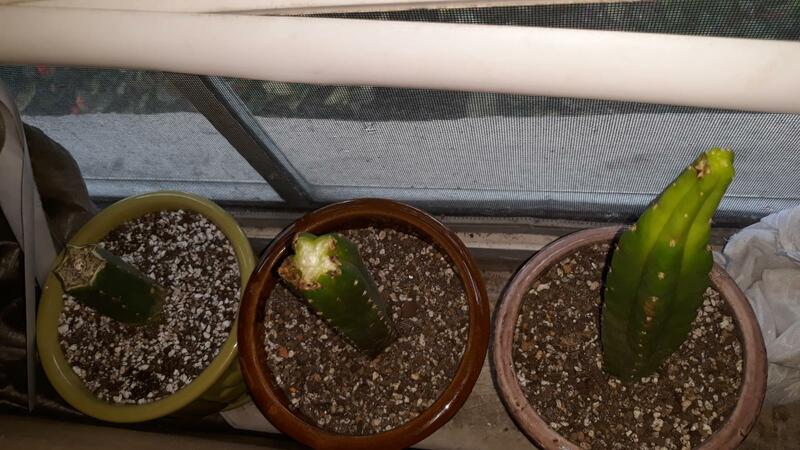 Anybody have any good advice for full spectrum lighting my cacti? Anyone ever use the brand BESTVA 2400 LED lighting system? I'm going to using them for my Torch and Loph cacti. I only have limited space too and I don't have room for a grow tent. Edited by coleman318, 21 October 2018 - 05:06 PM. You can trust skyewatcher's advice 100 percent. He's as knowledgeable about cactii as anyone and has the garden to prove it. Plus he bakes a mean birthday cake! Still searching for a full spectrum L.E.D. light system for my growing cacti. Edited by Cigarsam, 25 October 2018 - 07:00 AM. 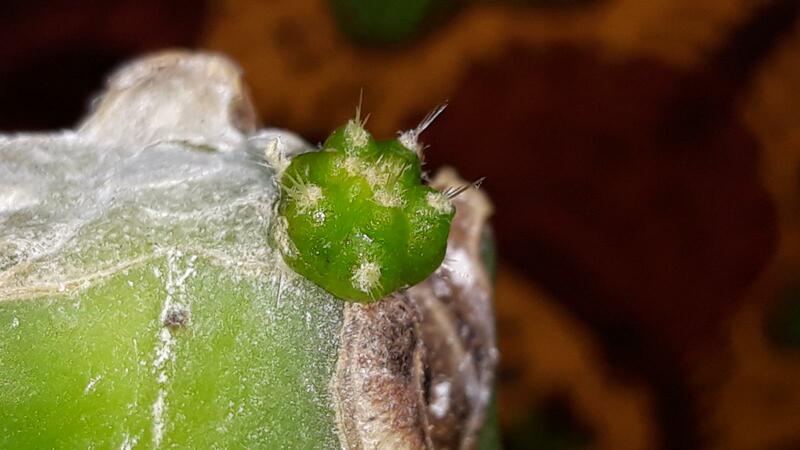 A little San Pedro pup has come along. 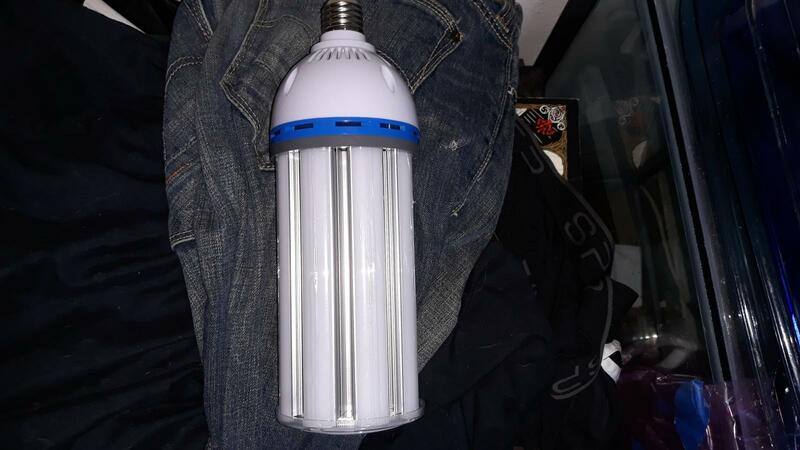 Just got a replacement 65w LED Corn Light Bumb with 6500 Lemens. 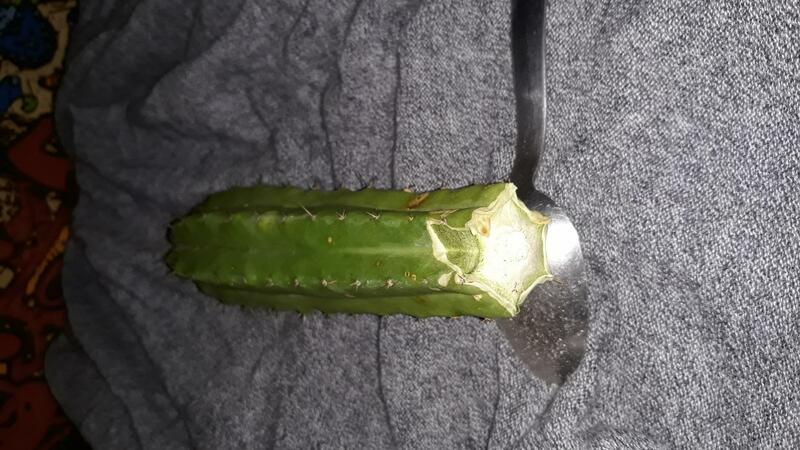 I am planning on hanging it from my ceiling but wanted to ask someone if they knew a safe distance I should keep it from my cacti and seedlings. Could anybody let me know if this needs to be removed? 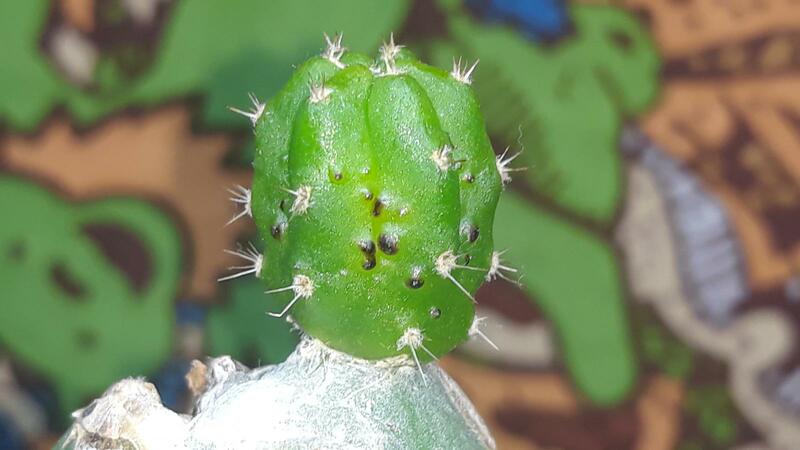 Its not too soft but it is the same on both sides of this Bridgesii. As long as it is not soft, and not oozing any watery discharge, I would leave it alone. It could just be scared damage from abrasion during shipping at some time. Odor is always an indicator of a problem. I sniff my cactus somewhat regularly. These cacti are loving this T 5 (6400) set up I got. The 65 LED Bulb puts out some nice white light. I still need a permanent place rather than in a lamp next to my friends. 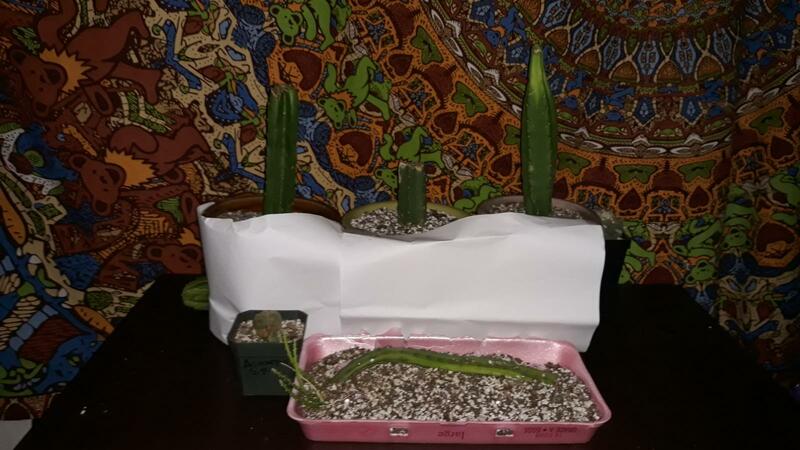 My T5 light set up I will use only for my cactus seeds. At the moment I'm just using T5 kit for my cacti and they seem happy loving. 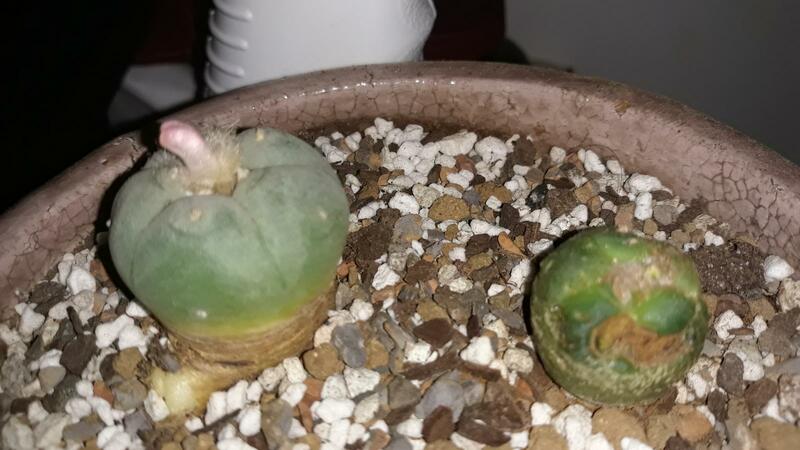 My loph looks like a flower it forming in the center. Still haven't got any roots forming from the Brigesii. 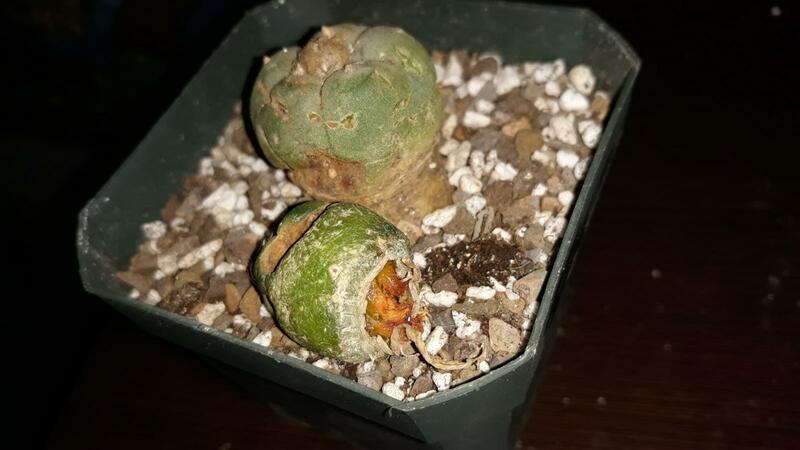 This is the bulb I mentioned in the previous post. New project coming sooner than later hopefully using my 20 gallon glass aquarium and giant bulb. 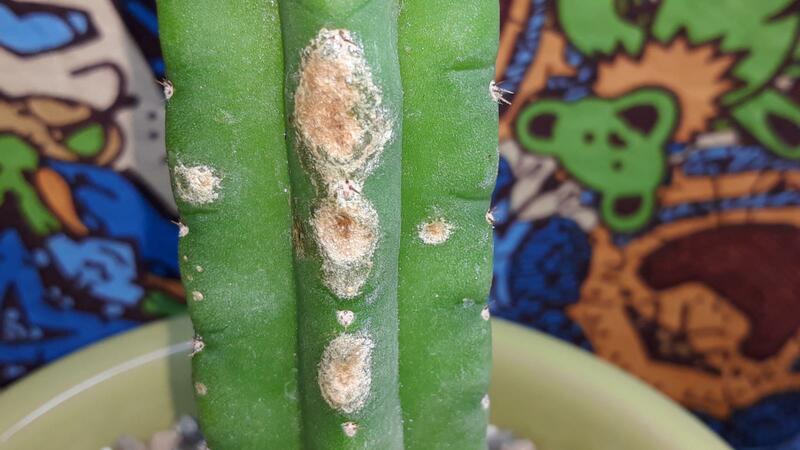 Just noticed these black spots on the San Pedro Pup. Does anybody have a suggestion for this stopping this from spreading? Black spots on trichs is a rather common thing. The debate as to what causes them rages on years later. They do not often cause a problem, but I find with lower humidity they are greatly lessened. Edited by Skywatcher, 13 November 2018 - 09:12 AM.